We've never had a priest working with the Mafia before. But I suppose you made some interesting contacts in Rome. 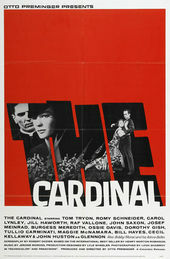 Author Pat Kirkham discusses the opening titles for The Cardinal, from her authoritative book Saul Bass: A Life in Film and Design. The beautiful live-action title sequence for this story of a priest who rises to the rank of cardinal reveals a remarkable sensitivity to light and pattern. A commanding piece of photography and editing, its elegant restraint counterbalances a majesty and beauty that might otherwise overwhelm. The sequence locates place, time and character: a young priest at the Vatican, the physical and spiritual center of the Roman Catholic Church, in Fascist Italy in the 1930s. A series of cross fades of steps, columns, mosaic pavements and surrounding spaces produce visceral visual pleasures. The powerful shadows and the slow movement of a solitary silhouette across a landscape, at once speciﬁc and abstract, suggest a darker side to this apparent serenity. The obligations and control — from which the main character never quite escapes — are suggested by the length and strength of the cast shadows. The darkness of the shadows is still in the mind when the camera moves to grafﬁti, with its abrupt reminder of the greater shadow of Fascism. Jerome Moss's score highlights the isolation of the priest and hints at tensions between him and his Church. In the end, the symbol was created out of the name of the ﬁlm, using lettering to convey a sense of monumentality. Imposing in its own right, the size and importance of the word "cardinal" is greatly reduced in signiﬁcance by the power and towering presence of "the," the structure of which symbolizes a greater power than that of the Cardinal, namely the Vatican.